Take the guess work out of ordering your Old Man Emu customized suspension system by ordering this complete kit with a single part number in a single box. The application of OME BP-51 High Performance Bypass Shock Absorbers has been engineered specifically for the Jeep JK Wrangler looking to achieve a desirable 4 height mark. This kit consisting of 4 shocks and 2 fit kits will fit both the LWB (Unlimited) and SWB variants for all year models from 2007 onwards, along with coils and a full list of other necessary components to keep the Jeep in alignment at the 4 level. OMEs engineering objective was to develop a complete 4 inch lift kit for the 2007+ Jeep Wrangler JK in both 2 door and 4 door variants. After researching the market on what options were available and the solutions that competitors offered, a decision was made to offer a well-engineered solution that provides excellent ride and handling characteristics. 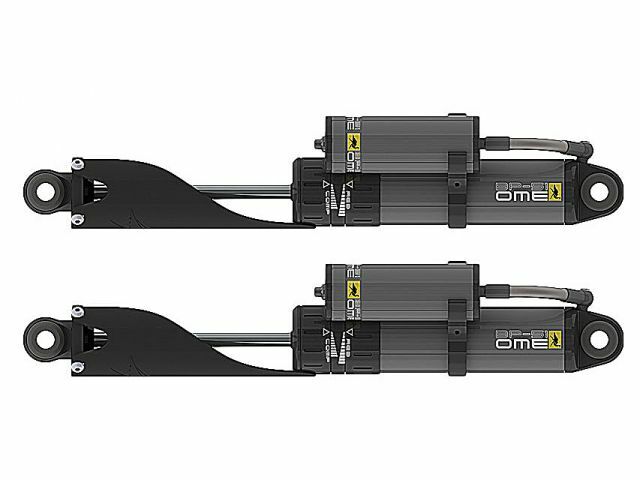 OME is offering an integrated 4 inch kit that easily bolts on and has undergone countless hours of engineering and testing. Lifting the JK Wrangler ride height beyond 2 inches introduces a range of new challenges which the OME engineers have addressed with a complete suspension solution. In addition to the velocity sensitive damping used in most shock absorbers, where the faster the piston moves, the higher the level of damping is generated, BP-51 shock absorbers also generate damping dependent on the position of the piston within the shock absorbers body via their bypass design. While most shock absorbers only generate damping based on fluid flowing through the piston, the BP-51 offers an alternative path from one chamber to the other, around the piston in the form of bypass passages. Some fluid flows through the piston and some fluid bypasses around the piston in the bypass passages. A rear Track Bar relocation bracket was developed to address the positioning of the rear track bar. This relocation bracket not only centers the axle but also raises the rear roll center to provide positive rear stability. Old Man Emu engineers have used Design Solid Modelling and FEA to ensure strength and durability. For all LHD Jeep Wrangler JK models, a steering stabilizer fit kit has been developed to relocate the stabilizer above the tie rod. By repositioning the stabilizer, it is less vulnerable to damage as its no longer the lowest part of the front suspension. Brake line relocation brackets have been developed to reroute factory brake lines to work with this kits extended shock lengths. The relocation bracket provides a cost effective, fitter friendly solution and no brake bleeding is required. A handbrake relocation bracket lowers the brake line mounting position to relieve stress on brake lines resulting from the higher ride height.